Most Fridays, I would really like to kick things off with a love letter to coffee. Nantucket Blend, you are the light of my life, though I sneak around with Pleasant Morning Buzz on the weekend. Leaving our caffeine addictions out of this, we’ve had a couple of sleepless nights this week; I’m very much looking forward to staying in bed tomorrow morning. Before we get too caught up in high hopes for sleepy Saturdays, might we suggest perusal of Dominique Falla’s tactile typography? 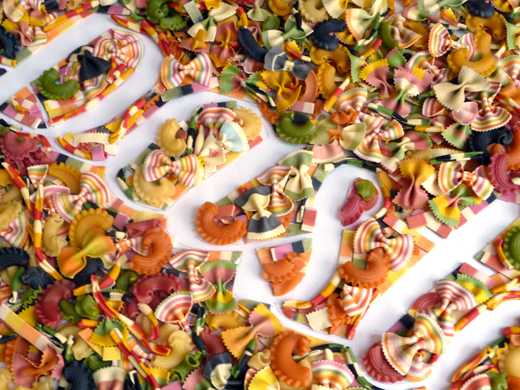 (Making-of shots of the pasta piece can be found here.) We’re keeping an eye out for screenings after watching the Sign Painters trailer, Boston.com has an explanation for the recent tree purge in the Fens, CoolHunting rounded up a selection of quotes from TED, and Pug Velo explores “bravery” – and how we misapply the term. This entry was posted in Art + Design, Friday Fancies, Music + Media, Musings + Quotables. Bookmark the permalink. thanks for the shout out on our “Bravery” post! I was also wondering what happened with the trees in the Fens and still don’t understand why they had to be cut down. What gives? Megan, absolutely – thanks for all that you do! (Jack rides through Central every day, we really loved that post as well.) I think the trees were cleared ahead of bridge work, opening everything up and re-widening the river? Still unclear, but at least it’s not beetles or something.